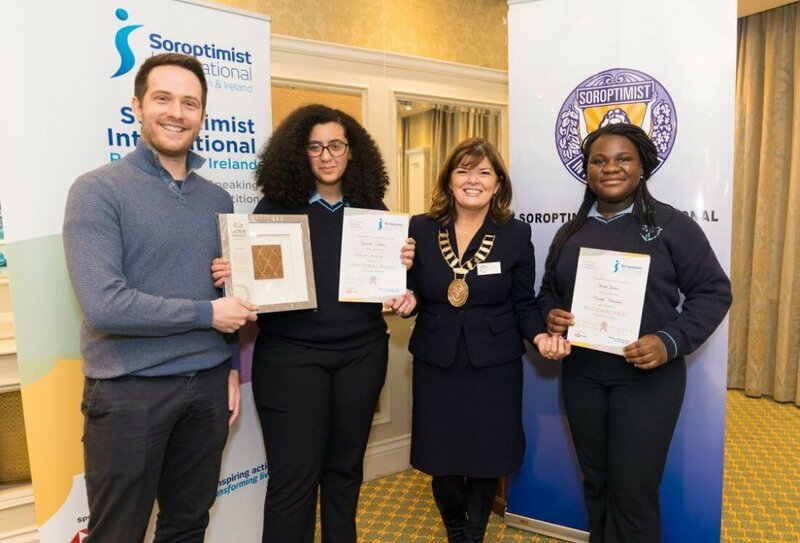 Congratulations to Mosope Omoniwa, sixth year, and Wiame Kinane, fifth year, on so powerfully representing our school and region recently in the Soroptimist Ireland Public Speaking competition. The students were two of ten competitors who qualified for this round from the entire of the west of Ireland. A special word of congratulations to Wiame, who will now represent the west of Ireland as one of just eight competitors in the national final in the K Club in early March. Mosope’s chosen topic was the empowerment of women, inspired by the Eleanor Roosevelt quote, “No one can make you feel inferior without your consent” and Wiame’s chosen topic was democracy, inspired by a quote by Ruth Bader-Ginsberg, “Women belong in all places where decisions are being made. It shouldn’t be the exception.” Both girls then had to present an impromptu two-minute speech on the very challenging topic of “meat”. Congratulations to both girls on very proudly flying the Coláiste flag. Picture: Dr Richie Hayes, the girls’ public speaking coach; Wiame Kinane, fifth year; Clare Colleran-Molloy, Mayor of Ennis and member of Soroptimists Ennis & District; and Mosope Omoniwa, sixth year.